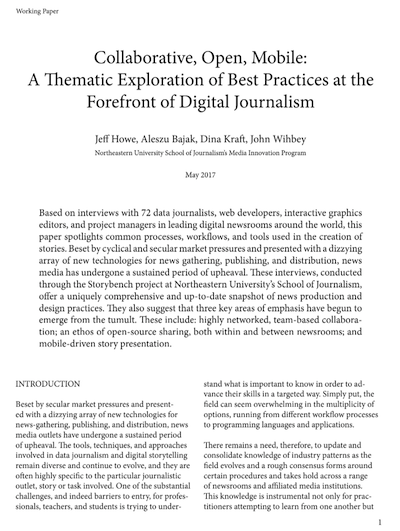 News organizations have been furiously covering Zika virus, a mosquito-borne disease which reappeared in Brazil in late 2015 and has since resulted in over 1.6 million cases. What has health officials worried is the virus’s association with microcephaly, a neurological birth defect, and the fact that there is no cure or vaccine. The World Health Organization declared Zika a public health emergency earlier this month. 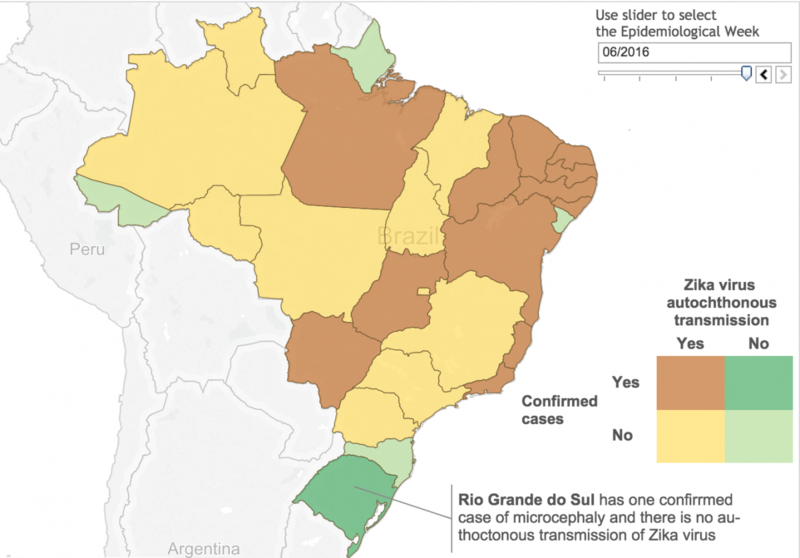 From tracking the disease over time to visualizing the spread of its host mosquitoes, news outlets and blogs have been covering Zika in compelling, visual ways. Storybench decided to highlight some of our favorite visualizations. Boston-based HealthMap combines data from news organizations, science publications, social media, and eyewitness reports to visualize the spread of diseases over time, including Zika. 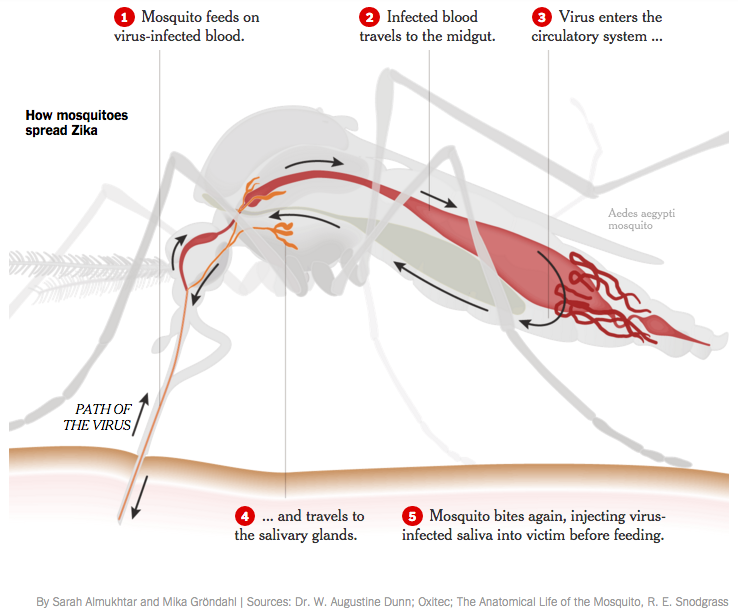 We liked their interactive Zika timeline where users can filter data to see the distribution of the two mosquito species associated with carrying the Zika virus. 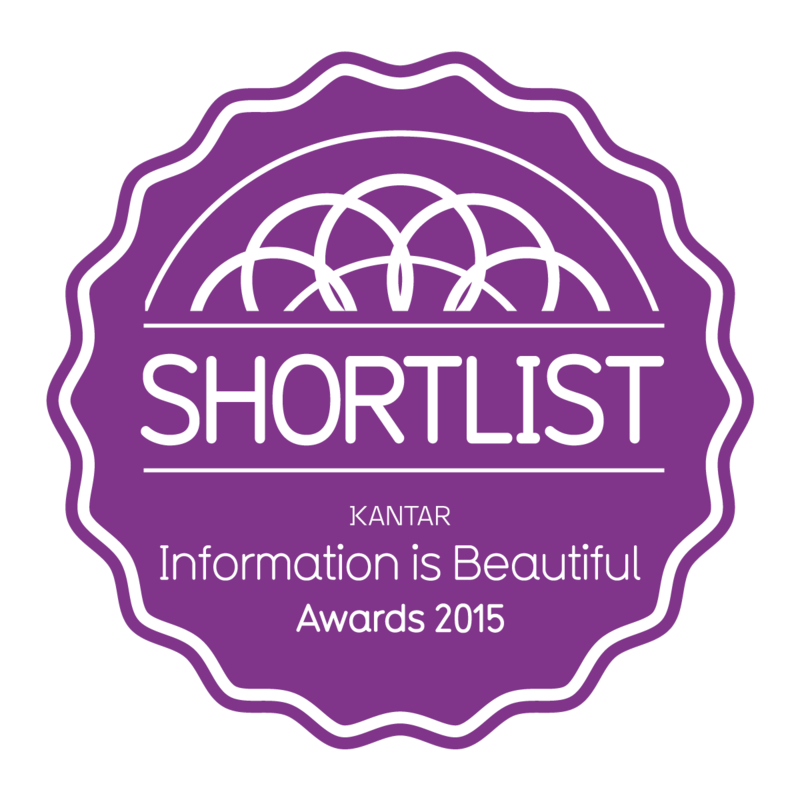 To aggregate and display data, HealthMap uses tools like MySQL, PHP, and Google Maps APIs. As part of their investigation on “The Zika Outbreak,” Frontline launched an app called “The Spread Of Zika.” Like HealthMap’s timeline, it tracks the emergence of the virus over time. Frontline, however, takes a more historical approach. 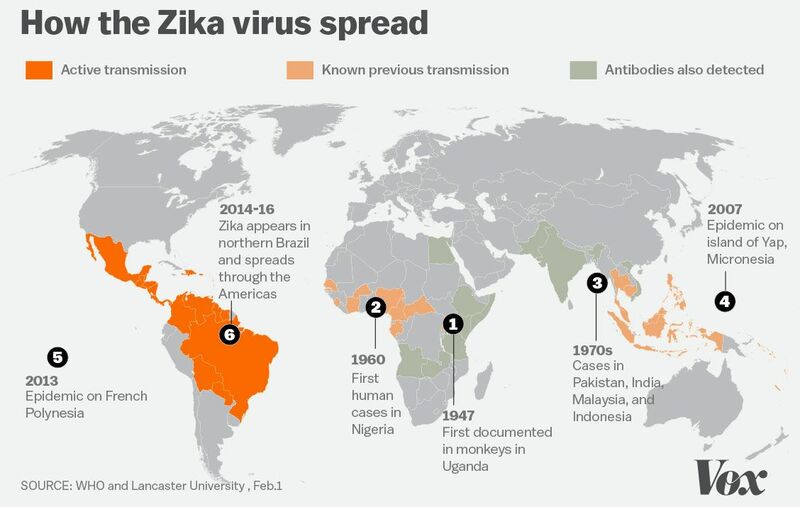 They detail the history of how Zika emerged, beginning in 1947 when it was detected in a monkey in Uganda. The screen splits between a world map and timeline text, and its scrollability syncs up smoothly while hopping across countries and time. The developers used MapBox and OpenStreetMap to visualize their data. Vox compared countries around the world with historic and active transmission of Zika. Nice use of colors and annotations. 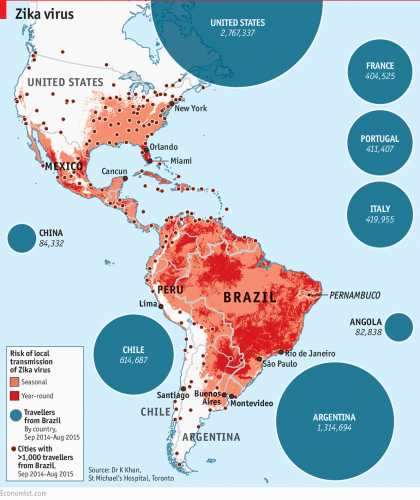 For their take on the spread of Zika, The Economist tweaked a figure in a January 2016 study from The Lancet. They increased the contrast of their white maps with shades of red rather than yellow, as well as combined the number of travelers to Brazil from their respective countries with representative circles. 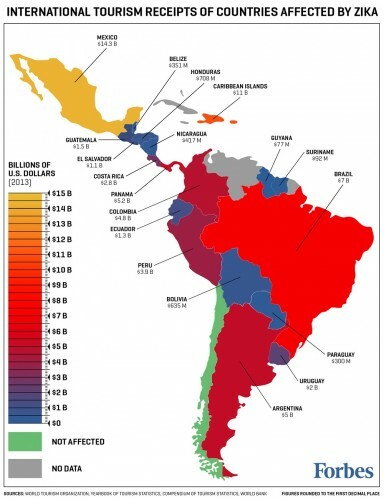 Forbes has a map showing the effect Zika could have on tourism around Latin America. This visualization is especially important with the Rio Olympics on the horizon. The colors are somewhat distracting from the point the map is trying to make. 1. Development tester Robert Allison used SAS to make a map predicting where Zika could hit next for his blog. He changed the color contrast of the data points and added a hover key over map location. 2. Medical student George Harris designed a map plotted the two mosquitos known to carry Zika using Tableau. The color scheme and bigger dots make Brazil pop on the map. 3. 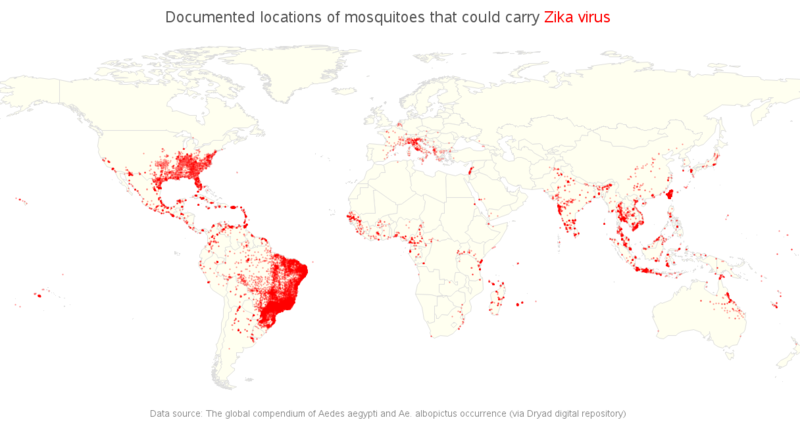 CartoDB user nerik created a map that also combined confirmed cases of Zika per country since 2015. The map has appeared in Popular Science. Ramon Martinez, a systems engineer at the Pan American Health Organization, has a penchant for epidemiology and digital mapping. 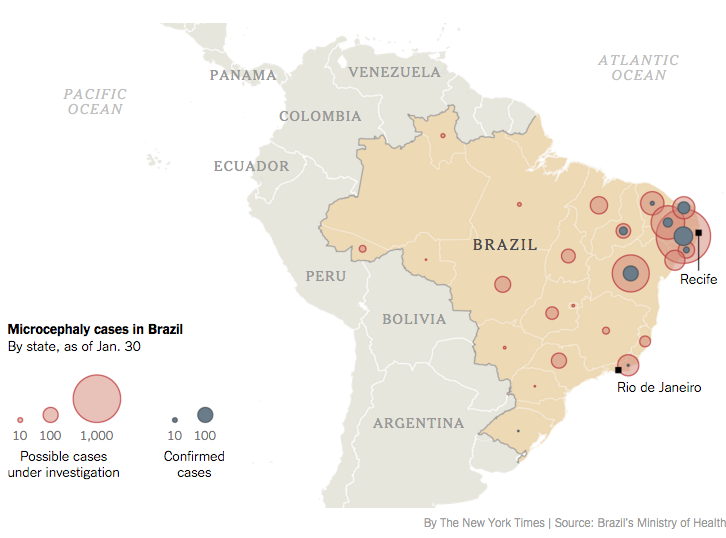 He recently mapped microcephaly cases in Brazil with Tableau. 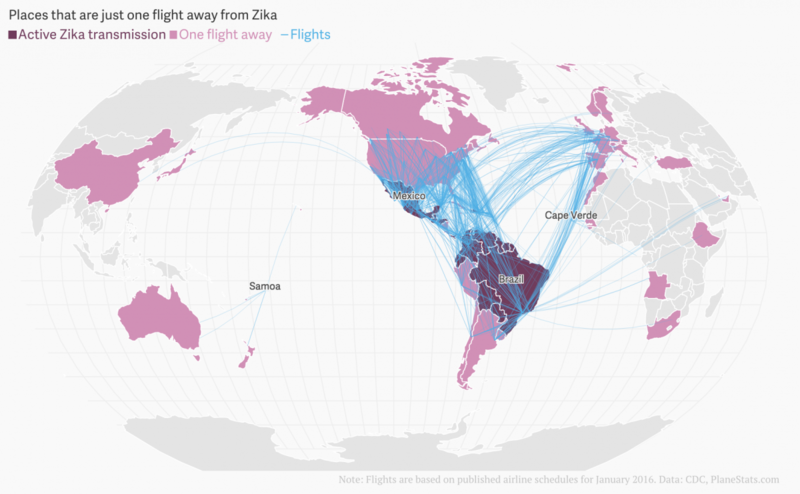 Quartz has produced an elegant infographic showing the 57 countries with direct flights to countries with Zika. Scientific American ran a similar map showing infected travelers returning to the United States. 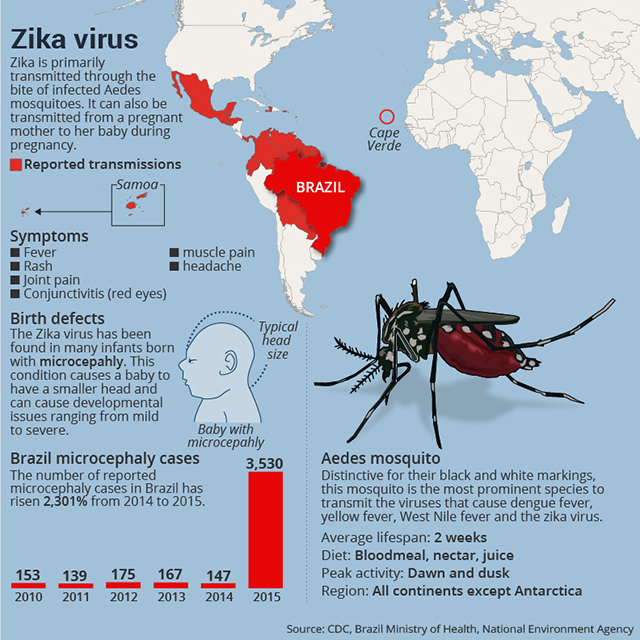 MarketWatch has a nice, simply-colored infographic that brings together data on countries with Zika transmission, the number of Zika cases in Brazil, the symptoms of Zika, and the biology of the Aedes mosquito. It’s well done, if almost immediately out of date. Margaux Phares is Storybench’s first intern. 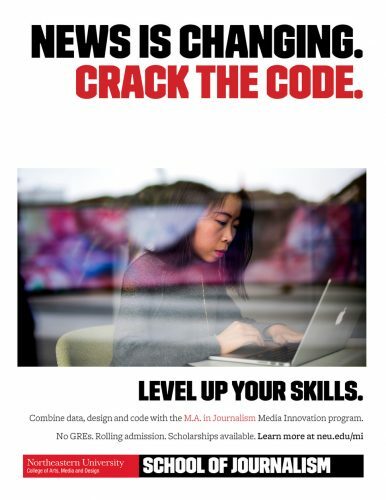 She is currently pursuing a graduate degree at MIT’s Science Writing program.